Summary: Whether you sleep on your side or back, the patent-pending snoreEzzz pillow will keep your head and neck aligned and may prevent snoring. 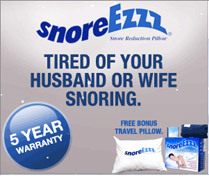 SnoreEzzz was Invented by a woman whose husband had a snoring problem, keeping her family awake night after night… today, thanks to snoreEzzz, they all sleep soundly! Whether you sleep on your side or back, the patent-pending snoreEzzz pillow will keep your head and neck aligned and may prevent snoring. The top pillow feels just like down, so you sleep like a baby.